Russian Foreign Minister Sergei Lavrov announced that Russia, China, Germany, France and the UK have agreed to establish a permanent expert mechanism that will be tasked with finding ways to maintain trade with Iran regardless of US sanctions. Sputnik discussed this with Professor Christopher Bovis. Sputnik: The EU has expressed support for preserving the nuclear deal, what reaction can we expect on this matter from the US? Christopher Bovis: In the current climate, the United States administration has voiced a very vocal opposition to anything that goes against their decision to block the Iranian deal that was signed in 2015 and they will try their best to undermine the cooperation between Iran and Iranian government and also European and other allies towards achieving the cooperation spirit that was signed in 2015. We expect some degree of opposition and we expect some other diplomatic and also commercial pressures applied upon the Europeans and also Russia and also China. Sputnik: What kind of pressure do you think we are going to see put on the European states? Christopher Bovis: Economic diplomacy translates into a type of sanctions in terms of creating obstacles to trade. Many European states witnessed that in previous examples, but also many companies, many sectors create a lot of opposition towards continuing the sanctions because it hurts their own prosperity as well. So you have a balance here to strike. Quite often the United States, the administration of the US uses the economic diplomacy as the method of unlocking geopolitical problems. We expect that to happen now in Iran, because at the same time the president of the United States visits Europe for crunch negotiations with NATO allies and also commitments towards that specific spending alliance on military equipment. Do you think the European states will be able to provide something for their companies? Christopher Bovis: So far, yes. The president of Iran visited Switzerland, after that he is currently visiting Austria and he is signing commercial agreements for two sectors that are crucial for the rapprochement of Iran towards Europe and the Western world. One sector is pharmaceuticals and the other is financial services. Behind these agreements are the countries, the states both Switzerland and also Austria. You will see a collective approach of Europe and also within the European Union towards enhancing the spirit and letter of cooperation agreement signed in 2015. Sputnik: Are you skeptical or do you think there is a good chance that this deal will be able to be preserved? Christopher Bovis: I am always optimistic but also you need to take into account the fact that Iran, the president of Iran, is facing tremendous opposition internally about the spirit of cooperation and the opening towards the Europeans and also the Western part of the world. What is important to remember here is that, that agreement was signed in 2015, which included the United States of America, Russia and other allies created the door to open for commercial and business cooperation between Iran and the rest of the world. This is the first step towards a full trade agreement towards that part of the world. That has geopolitical significance and this is why quite often the US cannot comprehend in terms of the progress: the speed of the progress and the implications of the progress. The announcement that they will be preserving the nuclear deal, or are trying to do so in any case, comes right before a NATO meeting. 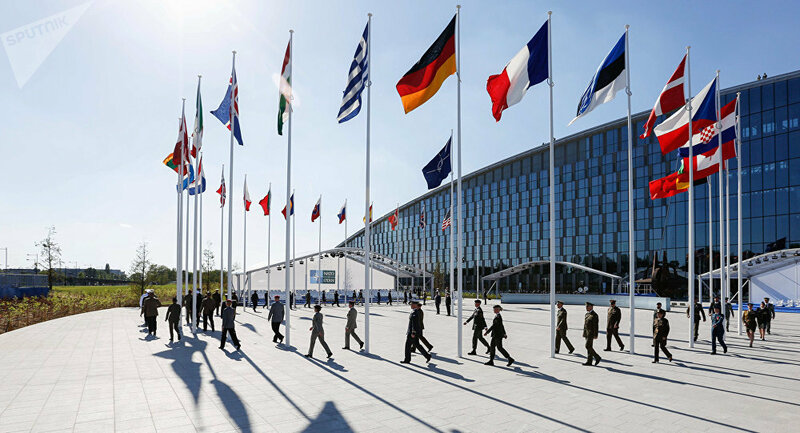 What impact do you think the NATO meeting will have and will this be a primary topic on the agenda? Absolutely, I believe so that the US administration, the president will use the commitment of the Europeans towards the nuclear agreement in 2015 with Iran to put pressure on the alliance members to spend more, to enhance commitment for military expenditure. The administration will use the NATO meeting to create more commitment on the part of the alliance for spending, which will benefit the US industries. Sputnik: The support for the Iranian deal also came at a time when the US introduced tariffs on China, Canada, Mexico and the EU. Many experts are saying that these developments could be escalated; actually they have been escalated to a global trade war. What are your thoughts on the trade war and how this affects the preservation of the nuclear deal? Christopher Bovis: We’re in an almost full blown trade war. The US administration announced tariffs for a number of Chinese products and also European products. The president of the US is keen to see some repatriation of money and some repatriation of jobs back into the United States and they will use every opportunity to create that friction with specific parts of the world: the European Union and also China. Within that complex environment, anything that relates to the geopolitical equilibrium, taking into account the Iran deal or any relations that are there with South America, the NAFTA agreement, that is in the melting pot of understanding how the New World Order, the de-globalization that quite often the US is mentioning, will create opportunities for them, for the Americans; but at the same time will preserve some degree of stability in the rest of the world. I believe that the trade war will escalate to the point that the World Trade Organization will have to be somehow revisited, not rewritten, but revisited for some degree of rebalancing regional trade and allowing some degree of free trade. The views and opinions expressed by Christopher Bovis are those of the analyst and do not necessarily reflect those of Sputnik.